Temporary Work Visas allow people to work for a U.S employer for a temporary period of time. These visas can be used for multi-year employment assignments, or for short-term projects in which a person may be in the United States for just a few months or on an intermittent basis. There are also temporary visas for multinational companies with branches in other countries who need to transfer employees to the United States for training or to work for a certain period of time. In these situations, a prospective employee will need to obtain a temporary work visa. You might be asking yourself, what do I need to do if I want to come to the United States to work? If you are interested in coming to the United States to work, understanding where to begin can be overwhelming. The best way to prepare for sponsoring employees for temporary worker visas is to have a skilled lawyer assisting you. 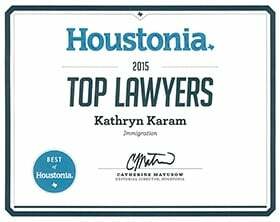 Kathryn Karam is an experienced Houston immigration lawyer who has assisted Gulf Coast businesses, including small and midsized businesses, with obtaining nonimmigrant visas for employees who are temporarily working in the Houston area. Kathryn Karam has experience handling complicated matters and finding creative solutions. She is well-prepared to take on your employment-based nonimmigrant matter. Call Karam Immigration law today at (832) 582-0620 to schedule a consultation. Karam Immigration law assists companies with immigration issues in the Greater Houston area, including Sugar Land, Cypress, Tomball, the Energy Corridor, Bellaire and Clear Lake. Do I have to register to file an H-1B Cap Petition? The H-1B visa is a temporary visa for foreign workers who are offered employment in a position requiring a degree or its equivalent. For most employers, the process of petitioning for an H-1B worker involves filing during the first five business days in April and hoping to be selected to be one of the petitions counted in the annual H-1B cap. There are 65,000 H-1B visas available for people with a bachelor’s degree or the equivalent (called the “regular cap”), and there are 20,000 H-1B visas available for applicants who have a master’s degree or higher from a United States university (called the “master’s cap”). Each year, after an employer files an H-1B petition for a foreign employee, the employer then waits to find out if the petition is selected in the annual H-1B lottery. You can read more here: Do I have to register to file an H-1B Cap Petition? In today's global society, companies are frequently looking abroad to find the right talent for their company. However, the intent of bringing the employee to the United States makes a significant difference in how you will go about bring the employee to the Houston area. If the intent is to keep the employee in the United States in a permanent position or indefinitely, then that employee would need permanent residence, also called a "green card." Kathryn Karam can assist your company with obtaining permanent residence for employees. If the work is for a set period of time, however, then the employee will need to obtain a nonimmigrant visa. A nonimmigrant visa for employment is often called a temporary worker visa. Nonimmigrant means the employee is not coming to the United States to remain here indefinitely. In many temporary work visa situations, the employer must first file the petition with U.S. Citizenship and Immigration Services before the prospective employee can get a visa to begin in their new position in the U.S.
For some visa classifications, a labor condition application is necessary to establish the wage offered to the prospective employee and the worksite where he or she will be employed. The potential employee must then submit a nonimmigrant visa petition. After the petition is approved, the worker may apply for a visa by completing Form DS-160 online, paying the required visa fee, and attending a visa interview to be conducted at the U.S. embassy or consulate in their home country. An attorney can smooth the process by helping prepare the necessary applications, and can prepare the employee for the interview. An experienced immigration lawyer can also handle the many potential complications that can arise during this process. H-1B Visas: These are for employees who work in a specialty occupation. The jobs they would fulfill usually require at least a bachelor's degree or equivalent education and/or work experience. Jobs that may qualify for an H-1B include academics, teachers, doctors, engineers, accountants, and architects. H-3 Visas: An H-3 visa is for employee training. For instance, if you seek to bring an employee who works abroad to the Houston area for specialized education for a temporary period of time. L-1 Visas: An L-1 visa is for temporary transfers within a company. If you have a multinational company with branches or operations in other counties, and seek to bring an employee of one of the overseas entities to Houston to work for a period of time on a project or in a new branch, that employee can seek an L visa. Certain companies can apply for and receive a blanket L petition. If a blanket petition is approved for a company, the company no longer needs to file an L-1 petition with USCIS for most of its employees seeking L-1 visas. Most employees seeking L-1 visas may apply directly at the U.S. Consulate or Embassy in their area. This allows for much quicker timeframes for bringing in employees from other countries. O-1 Visas: O-1 visas are for people with extraordinary ability in art, science, education, athletics or business. The person must be at the top of their field, earned distinction, or have extraordinary achievement. TN Visas: Professionals who are citizens of Canada and Mexico can receive this visa under the North American Free Trade Agreement (NAFTA). Their position must be listed on a designated list of TN-approved occupations contained in APPENDIX 1603.D. 1, ANNEX 1603 of NAFTA. In addition, the prospective employee must possess the required education and/or experience indicated. If you are an employer seeking to bring an employee to the United States to work for a set period of time, that employee needs a nonimmigrant work visa. Kathryn Karam is an experienced Houston immigration attorney who can assist you with obtaining the necessary temporary employment-based visa. If you are a company in the Houston area, including West University, Kingwood or The Woodlands, call today at (832) 582-0620 to set up a consultation.